Caught red-handed throttling the performance of their iPhones, Apple has responded with an open letter to customers explaining the throttling was necessary to prevent random shutdowns. Unless you've been under a large Nokia the past few weeks, the short of it is that Apple has been caught red-handed throttling the SoC speeds in their phones by over 50% when older batteries are installed. Replacing the older battery with a newer battery results in the resumption of the phone's full speed. 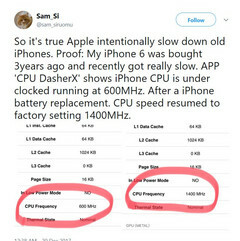 Naturally, this has sparked the ire of iPhone users who had long suspected their devices were being slowed down with iOS updates in order to encourage buying a new phone. Apple released a statement soon after, stating that the software throttling was necessary to avoid random shutdowns caused by older batteries' inability supply a peak current. Noting that "there's been a lot of misunderstanding about this issue", Apple has decided to set the record straight with an open letter to their customers about the iPhone battery and performance. "We would never do anything to intentionally shorten the life of any Apple product," the message reads, but it's a questionable statement from a company whose phones, tablets, and computers have all soldered components that are completely unupgradable and extremely difficult to repair. The letter continues by confirming that the throttling was added in iOS 10.2.1 in order to prevent sudden shutdowns. Somehow, however, Apple claims that it didn't make any connection between reports of poor performance and the iOS 10.2.1 update. Now, though, after users posted proof that the batteries themselves were leading to throttling, the Cupertino company believes "there is another contributor to these user experiences" that is indeed related to the chemical aging of their batteries. 1. Starting in Late January, Apple will reduce the price for an out-of-warranty iPhone battery replacement from US$79 to US$29. 2. Sometime in "early" 2018, Apple will add a feature to iOS that presumably gives more information to the user regarding the battery's health. At the end of the day, the problem here isn't that Apple took measures to mitigate a defect, but that, as usual, they didn't tell anyone about it until they had to. The message ends with "We will never forget [your faith and support] or take it for granted", but these words would be less hollow if they had more precedence behind them.